Working on a laptop in an uncomfortable position for hours can be quite tiring; here are some options to make things smooth and comfortable. 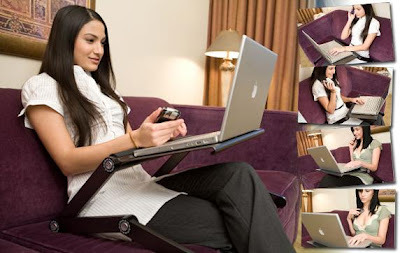 Laptop Desk: Made of aluminum, weighs 5.29 lbs and can stand weights of up to 26.5 lbs; it has a stable, flat, platform-like surface, to balance whatever you need to place on it, all while keeping your lap cool and comfortable. 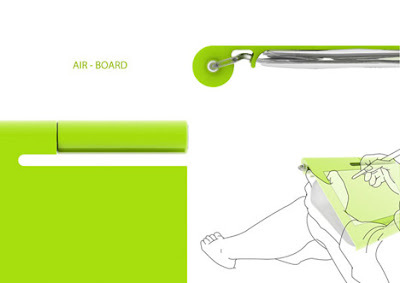 It can easily change its shape to suit a wide variety of functions. All you have to do is just press the button, change the position, and release the button to set it in place. 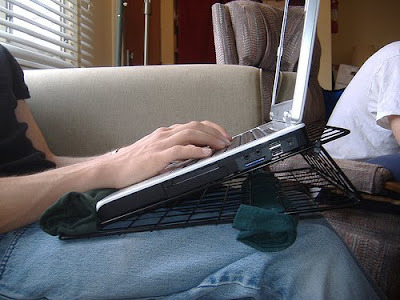 Aviator Laptop Stand: This one works just great in your lap when used on top of laptop Case, notebook or any flat item. MDFLaptop Stand: Inspired by the heeled footwear of the same name, this stand can be self-assembled without any glue or other fittings. 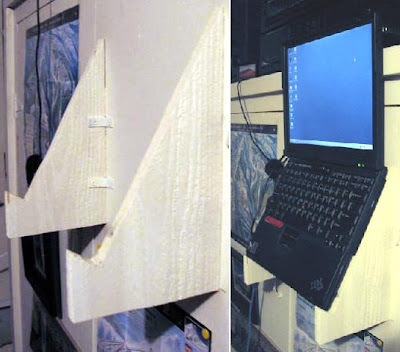 This Laptop Stand holds your laptop in a wooden stand. 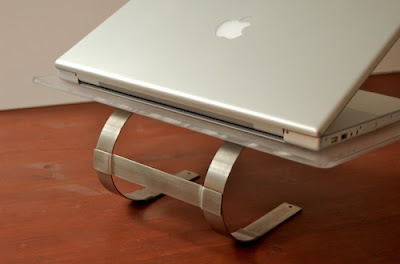 Nottable Laptop Stand: A unique stand, made from aluminum, bronze and plastic components by designer Nelson Motta; allows computing in all positions. 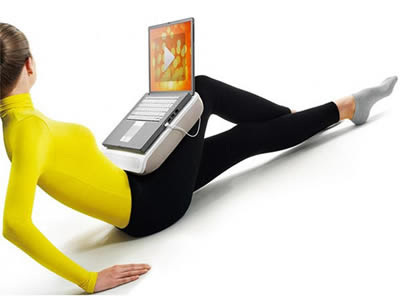 It exhibits great flexibility, allows different working postures (sitting, standing or even reclining) to the users. 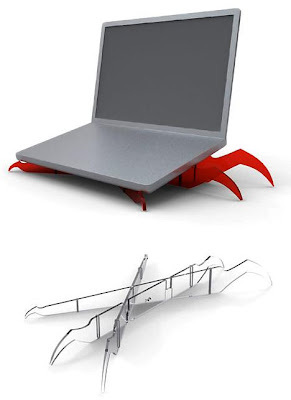 Arachnoid Laptop Stand: Creation of Duncan Fitszimmons, its pretty cute with rubber feet to grip both the laptop and the desk. 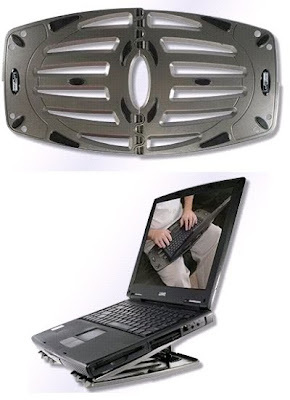 Elevator Laptop Stand: It raises your laptop 5.5 inches off your desk while providing valuable desktop real estate for your keyboard and mouse. iFold Stand for Notebooks: Made from acrylic of the highest grade, embedded with chromed zinc alloy hinges, and pads are made from non-slip rubber material. Plus it has a folding mechanism that allows you to put it into a notebook bag. 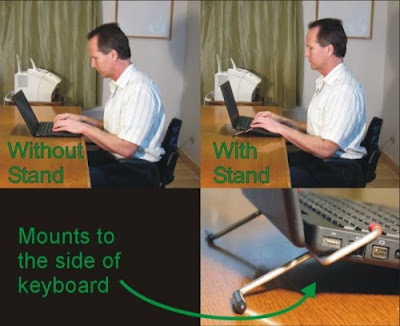 mStand Laptop Stand: Its simple, effective, and the design elevates the laptop and makes it more ergonomically suitable for desktop use. 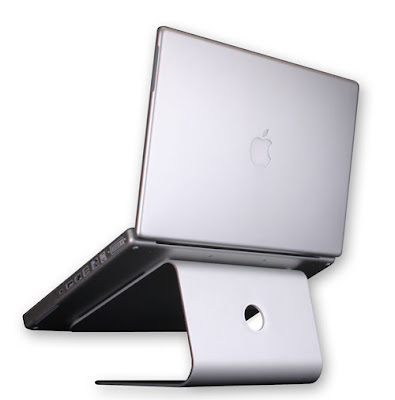 Futura Laptop Stand: Its made from ultra light-weight ABS plastic; "and if you're using it as a desk stand, just fold it right down the middle and fasten at any one of five different angles to position the screen to a level that suits you." 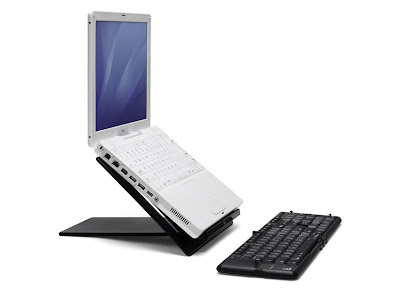 IDesk Laptop Stand: It comes with six levels of adjustable inclination angles and an integrated USB hub with four to seven ports. Best suited for those who want to use an external keyboard with their laptops. Laptop Stand with 4-Port USB Hub and Speakers: A space saver, this stand comes with a built-in 4-port USB 2.0 hub and a pair of stereo speakers. 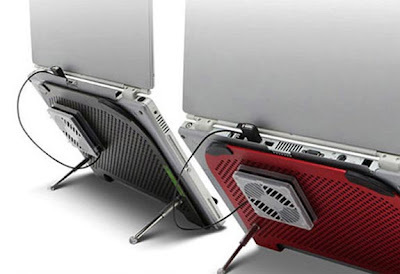 iRizer Laptop Stand: Its very portable, light and fits right into backpack along with laptop. 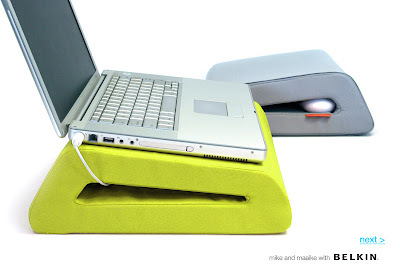 Cushionspeaker Laptop Stand: As the name suggests this laptop stand is moulded into a cushion, it also has in-built speakers that are USB connectible with your laptop. 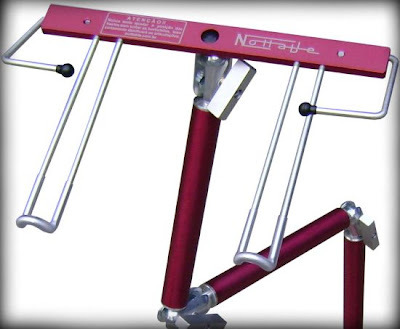 Latosta Portable Laptop Stand: Made of 304 stainless steel grade, its super lightweight. Minifit XL Laptop Stand: It has a movable USB powered fan to keep your laptop cool plus it can take laptops up to 15 inches. 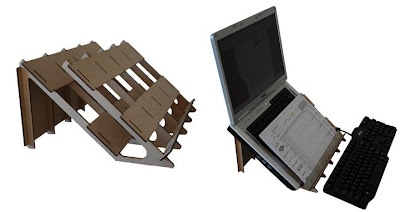 Bamboo Laptop Stand: The stand includes two USB-powered 2.5 ? (5cm) fans to keep your laptop cool. 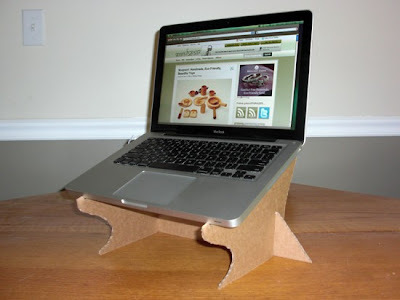 DIY Laptop Stand: This one is put together from an old ikea grundtal paper towel holder and some plexiglass sheet. Airboard: "The "Airboard" pump action laptop surface by designer Ki-Seung Lee is intended to adjust your laps productive area to best fit whatever activity you are engaged in." Laptop At Home: Mike and Maaike, San Francisco-based designers, designed this new 'Laptop at Home' line for Belkin. 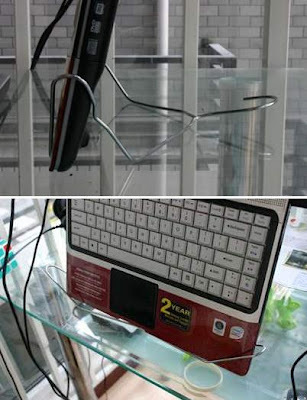 Fingers Notebook Stand: It's made of clear acrylic; the screen is raised closer to eyelevel offering better ergonomics, while the keyboard is placed at an angle which results in improved typing comfort and better processor ventilation. iRizer: Its portable and folds up to just 14 mm (two slim acrylic plates are only 0.55" thick) which easily fit into your notebook bag. Plus its sleek interlocking design lets you adjust your laptop to the height/angle that's most comfortable for you - 20°, 30°, 40°, or 50°. 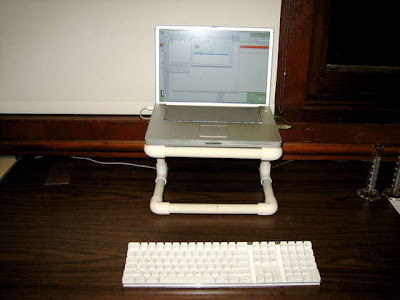 Homebuilt Laptop Stand: Not sure how one would type on the notebook keyboard itself. Would work just fine if you go in for a wireless keyboard and mouse. 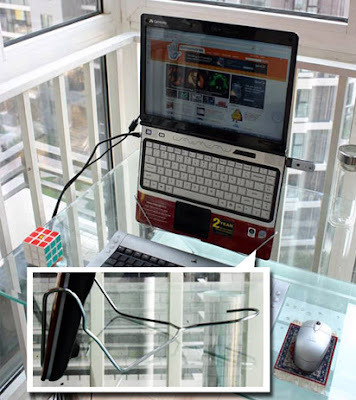 Wire Shelf Laptop Stand: Here are details to make one - link. 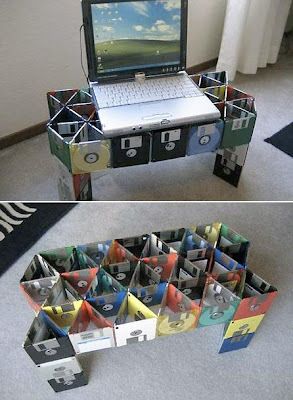 Floppy Disks Laptop Stand: To create this one you need 82 floppy disks, a cardboard base, popsicle sticks and glue.